When I was contacted by one of the home renters they were being charged $1,000 for pool repairs to the plaster’s surface. These tenants are all seniors in college and were not wanting to pay for something they had nothing to do with. When I showed up to the home in Bay Ho, San Diego, I immediately knew these issues were due to age and poor water chemistry. Spot etching on pool plaster is due to the levels of Cyanuric Acid being too high for an extended period. This causes the chemistry of the water to become corrosive and ends up eating away at the plasters weaker aggregate. When spot etching happens, it creates a cosmetic appearance of small to large circular formations in the plasters thin surface material. It will sometimes create what looks like snail trails in the plaster. This issue over time will start to progress inwards, destroying the cream coat of the plaster that is the thin smooth surface layer. This is a pool repair that cannot be made as it is a sign that the plaster pool surface has started to fail. With this problem, you will want to drain the necessary portion of the water to correct the Cyanuric Acid/conditioner level to the desired 50ppm or lower. By doing this you will reduce to quick breakdown of the plaster though, it has already happened and will continue. Repairing this problem correctly would consist of replastering the swimming pool. When plaster delamination occurs, the plaster has separated from the shell/gunite pool structure. This problem can be exacerbated by having bad water though it is most typical with an older pool surface. Plaster delamination is a sure sign that the plaster in this pool in Bay Ho, San Diego has completely failed. 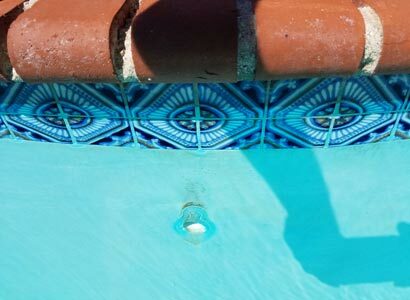 When plaster delamination occurs, we have seen bad pool companies perform pool repairs that will not hold up. The pool plaster is going to continue to lift and break away from the shell of the swimming pool or spa. Offering a pool repair for this problem is not right as the only true way to repair is to replaster the entire surface. Black pool algae is the worst algae a pool or spa can encounter. 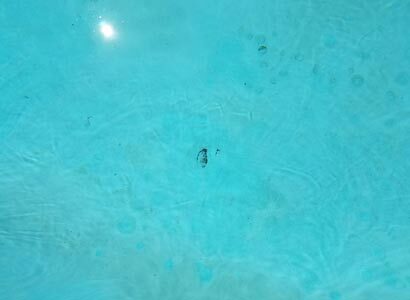 We often call this type of pool algae the cockroach of all pool algae problems. This saying is due to they are almost impossible to get rid of similar to black pool algae. When black algae forms, it roots into the surface material of the pool creating a very resilient form of algae. They do sell a black algaecide though it is not guaranteed to work. Black algae removal is a difficult thing to solve but you would usually start by checking the water’s chemistry and correct first if needed as certain algaecides have specific water chemistry requirements. Once that is done, you would want to disperse a granular form of chlorine onto the affected surface. This will start to kill the algae if able and then you would need to scrub with a nylon brush. This process would continue until you achieved the desired result or as good as you can. Then you may choose to run a black algae treatment to try and finish it off and prevent it from returning though that is never a guarantee with black algae. With all of these problems found, there was no way possible these renters were the cause of the problem. All of the damage discussed is due to the overall age of the swimming pool and spa along with bad water chemistry for prolonged amounts of time. Pool plaster ages and is usually good for ten or so years and more if proper weekly pool service is performed. 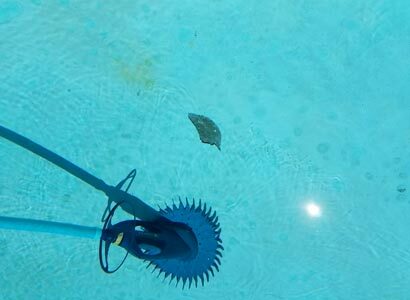 With a good weekly pool service, you can greatly reduce the damage to the pool surface and reduce the need for unnecessary pool equipment repairs. 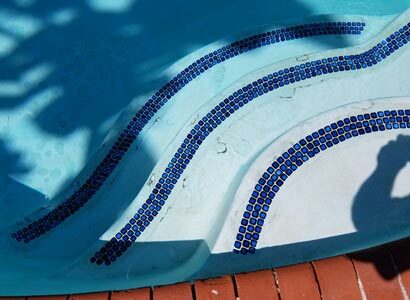 We are a professional pool repair and pool service company that works throughout the entire San Diego area. If you are in need of information or want to schedule a pool repair, new equipment installation or any specific pool services, we can help. Cannot recommend these guys enough. Saved us $1000! Our property manager was coming after us for fraudulent damages stating that a “bowling ball” must have damaged the pool. Kevin came right out, did a full pool inspection/test of the water and concluded that the damage was plaster de-lamination due to years of wear and tear chemical imbalances not due to “tenant neglect and misuse”. Took pictures and gave us the facts in writing to use in our case against the owner. Don’t know what we would have done without these guys. Would have rolled over and paid the initial estimate for repair, which we now know is a scam on behalf of the owner and the original disreputable repair company. When I asked Kevin out of curiosity how much ProTouch would charge to repair the damages, he informed me that it would be pointless to repair it at all as it will keep happening across the rest of the pool. Instead of making a quick buck off of us, he gave us the best long-term advice possible..